The Nigerian army has debunked claims that Boko Haram factional leader, Abubakar Shekau, escaped to Cameroon. The director of army public relations, Sani Usman, said the army does not know the whereabouts of the terrorists' leader. In a statement issued on Friday, February 16, in Maiduguri, Borno state capital city, Usman said the report is misleading. He said the Nigeria army is still in a manhunt of the terrorists' leader as N3 million was placed as a bond on Shekau. He also urged journalists to always cross check their facts with the military authorities before publication. Usman said: " The attention of the Nigerian Army has been drawn to a news story on some news medium, alleging that the wanted factional terrorists’ group leader, Abubakar Shekau, is in Kolofata, Republic of Cameroon. “The report alleged that a top Boko Haram commander; Abdullahi Bello, alias Abu Zainab, who was captured by the Nigerian army on February 14, disclosed that Shekau escaped to Cameroon. “This is not true; the Nigerian army did not arrest such person, neither do we have such suspect in our custody. “Contrary to the allegations; the Nigerian army is not aware of the whereabouts of Abubakar Shekau, hence the reward of the sum of N3 million for any credible information on his whereabouts," Usman said. NAIJ.com earlier reported that a top Boko Haram commander, Abdullahi Bello alias Abu Zainab, who was captured by the Nigerian army on February 14. It was gathered that Zainab disclosed that the wanted factional leader of the sect, Abubakar Shekau, has escaped to Kolofata in neighbouring Cameroon. Sahara Reporters, citing military sources, stated that Zainab was arrested in Bauchi while fleeing to Kano. 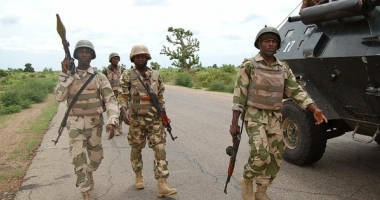 The captured commander was said to have told the army that he and other commanders were forced out of Sambisa Forest due to the offensive by the military troops involved in Operation Deep Punch 2.